Pleased to see all the attention this thread has gotten. Anyone know where to find full shows of some of those videos posted on Youtube. As far as I know the only live dvd Tosh has out is Captured Live, would love to check out some more shows if they are out there. There is a site out there with list of bootleg material. Give me a moment and I'll see if I can find it. My fav Tosh song is Downpressor Man. BTW: The greatest solo album IMHO by any of the Wailers is Bunny's Blackheart Man, check it out! Anyone have the Tosh acoustic album, its him talking and playing tunes with just him and his guitar. Also saw another Tosh cd on Amazon of some sessions he did in 1969 where he plays a lot of organ. Anyone familiar with these? Or know of any other Tosh cds out there that I may not be aware of?? That stuff sounds interesting. You can find some Peter Tosh bootleg traders on line, do google search and some come up..
Have ya seen the Keith And Reggae-thread, Rocky? Page 2 at the moment. Yeah, bro...that's how I dance !!! Crap Rockman, now you tell me about the extra track... Well I ordered the acoustic album a few days ago. Look forward to checking it out. BTW, Sublime does a cool version of Steppin Razor. 20 years ago - Sept 11 1987 - armed men entered Peter Tosh's home on Plymouth Avenue in St Andrew and gunned down all seven people present killing Peter, the broadcaster /singer Jeff 'Free I' Dixon and Wilton Brown. Survivors were Tosh's common-law wife Marlene Brown, Carlton Davis Yvonne Dixon and Michael Robinson. Why this happened has never been fully uncovered, but an attempt at Marlene's life a month later could be taken to support her view that murder had been the whole purpose of the raid and not just a robbery carried out with maximum violence. Will light a lotta candles for the good Macintosh. > robbery carried out with maximum violence. Thank ya for the reminder, Sohoe! A True Legend has been gone for twenty years already. Edited 1 time(s). Last edit at 2007-09-11 02:09 by Baboon Bro. "Anyone know where to find full shows(...) would love to check out some more shows if they are out there." You're welcome Bro, eventhough not the best thing to be reminded about. Edited 1 time(s). Last edit at 2007-09-11 02:03 by Sohoe. Edited 1 time(s). Last edit at 2007-09-11 02:36 by Baboon Bro. It's funny this topic came up. I've been listening to nothing but Tosh for the past two weeks with the exception of "Full House" (Geils). just deleted my blog hommage for Tosh. Edited 1 time(s). Last edit at 2007-09-11 09:33 by Baboon Bro. Now tried to make it all over. Just hope this will remain. The OGWT with the original wailers is great. The Marley,Livinston& Tosh line up of the wailers was the best. one of the best gigs I've been to was Culture at the Rainbow around 78. their Two 7s Clash album was a huge favourite with the punks. It was that album that made me realise that their was far more to reggae than i realised. destruction of my blog was "a mistake". So there is two Tosh's up there now. Plant a vegetable for peace today ! Surpirsed to see my thread bumped up... Bingo, thanks for the Tosh in Montreux show, its great and much appreciated. Didn't know that Tosh's murder happened on 9/11, interesting bit of info. 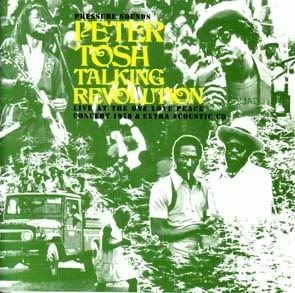 Does anyone know where you can get Buckingham Palace by Peter Tosh, saw him in 1980 at the Rainbow, and really remember that one! My pleasure Hound Dog, glad you enjoyed it. It's my wifes favourite DVD in my collection. Peter's gone, but never will be forgotten. Thank you Peter Tosh for leaving us with wonderful music. Edited 1 time(s). Last edit at 2007-09-11 19:09 by Bingo.